You should hire a New Haven carpet cleaner once every year to maintain the color and quality of the carpet in your home or business. Deep cleaning from a professional service helps remove embedded dirt and bacteria from carpet fibers. You want to hire a local carpet cleaning company that delivers amazing service and healthier cleaning results for your home. You can research a company at their website and search for online reviews from previous customers. You will come to find that Chem-Dry of Fort Wayne is your best choice for carpet cleaning in New Haven, IN. We are the local representative for the Chem-Dry brand and provide services featuring green cleaning solutions, powerful equipment, innovation and industry-recommended technologies. Our staff is trained in the proper care of all types of carpet and rugs and upholstery to ensure your home is cleaner and healthier when we are done. Chem-Dry of Fort Wayne uses The Natural®, a carbonation-based cleaning solution, to lift dirt and particles from carpet and upholstery. The solution creates millions of bubbles powerful enough to push bacteria to the surface area of your carpet. Then we use Hot Carbonating Extraction (HCE) to purge the bacteria, germs and dirt from the carpet. The entire process is efficient, effective and eco-friendly. There are no chemicals or soap and we use 80% less water than steam cleaning companies in New Haven. 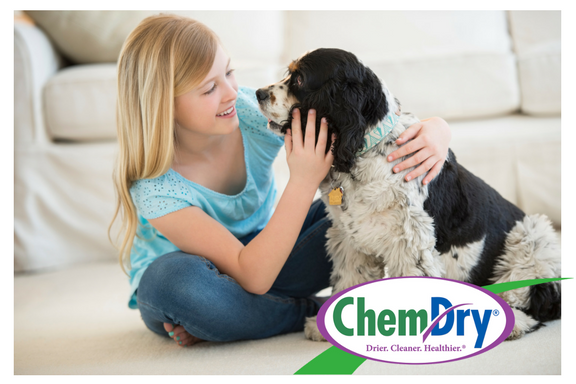 Your carpet is dry in no more than one or two hours after an appointment from Chem-Dry of Fort Wayne. We offer upholstery and furniture cleaning too! The same principles from our carpet cleaning service are applied for your furniture. We clean sofas, recliners, ottomans, dining room chairs, car interiors and more! We vacuum pet hair, loose debris and dirt from the surface of the upholstery and then spray The Natural® onto the cushions and upholstered sections of the furniture. Then we use our powerful suction and extraction tools to remove the solution and dirt from the furniture. 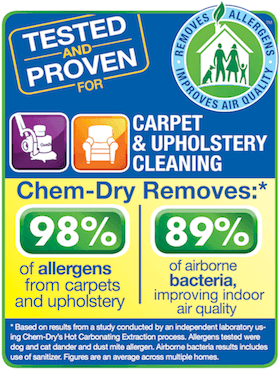 This service from Chem-Dry of Fort Wayne removes over 98% of allergens from furniture! Chem-Dry of Fort Wayne rug cleaning in New Haven, IN removes particles and bacteria from area rugs, rug runners and fine textiles including Oriental and heirloom rugs. You can trust your fine textiles with our certified technicians. We ensure the proper care for the materials and construction of all area rugs in your home. Learn more about our services online. To schedule an appointment from Chem-Dry of Fort Wayne for New Haven carpet cleaning, upholstery cleaning or rug cleaning, call (260) 409-1138 today!